RutabagaPie Designs: Gina Marie Designs Wine Label Dies + Unity Stamp Co! - WINNER ANNOUNCED! Gina Marie Designs Wine Label Dies + Unity Stamp Co! - WINNER ANNOUNCED! Sorry everyone, I've been working on so many projects when I'm not actually WORKING, that I totally forgot about this drawing until a few people reminded me. Thank you for that!! So without further delay..RandomNamePicker chose Sherry as the winner for these gorgeous Gina Marie Designs Dies!!! 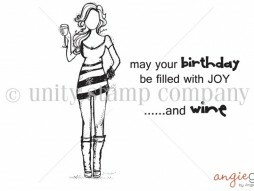 Very fun card..LoveLoveLOVE that sentiment and those wine Label dies.. they pair perfectly! I have a friend that works for the Traveling Vineyard and she'll get a real kick out of this .. so will all of the regulars! Thank you to everyone who commented, I'll have another drawing coming up soon and I'll put the draw date on my calendar, lol! Hi everyone, popping in here to show you this awesome new die set called Wine Labels by Gina Marie Designs. I just absolutely love these dies. They cut and emboss, and you get 4 different sized/shaped designs in this pack. Click Here for Gina's shop for Dies, Stamps and More! Keep scrolling for information regarding my giveaway!!! Wine Label Dies - Click Photo for direct link! I really love this Angie Girl stamp by Unity Stamp Co. named "Miranda Girl" and the sentiment, also from Unity, is so funny! I can think of many of my wine loving friends that will get a kick out of this! Unity Stamp Co. - Click either photos for direct link! So the exciting news is...I have a giveaway going on..one very lucky person who leaves a comment on this blog post will win a brand new set of these Wine Label Dies by Gina Marie Designs! Contest closes 1 week from today, Feb 15th. Winner will be chosen using RandomNamePicker and announced right here! Everyone is eligible. You will have 2 weeks to claim prize and I will make every effort to contact you. I host giveaways of Gina Marie Designs dies periodically, by subscribing to my blog you'll have more chances to win! Thanks for stopping by today, leave me a comment, I'd love to hear what you think! Hahaha...I love that stamp. Your card is gorgeous. I love the red and gold hearts and the colors you used for the girl are perfect, especially the skin colors. Those are always had to get right, but you nailed it. Lol! This is hilarious! I love this stamp set and the dies are beautiful! Thanks for a fun giveaway and showing me another company that sales dies!!!! A really fun card and a great giveaway - I have my fingers crossed! This is such a fun card! The stamps from unity are awesome and Angie's Girls are my favorite! The wine lables is a beautifl touch for this card, perfect! Thanks for the giveaway and sharing your talents with us! Oh I like these labels! Beautiful how they emboss and cut! Your card is beautiful! Please count me in for the awesome giveaway! Thank you! Love this set...it's so me!!! Have the stamps so need these dies! Thanks for the chance to win them! Hihihihihi . . .excellent card and you sentiment cracked me up! Too funny and the Unity gal goes great! Love your card! So many possibilities with this set! So fun and well done. I love how you used the label die. Your coloring is awesome. This made me laugh out loud! I'm going to have to go shopping at Unity! I love the card, sentiment and the label die! I'd love a chance to win it! Great card - I love it! 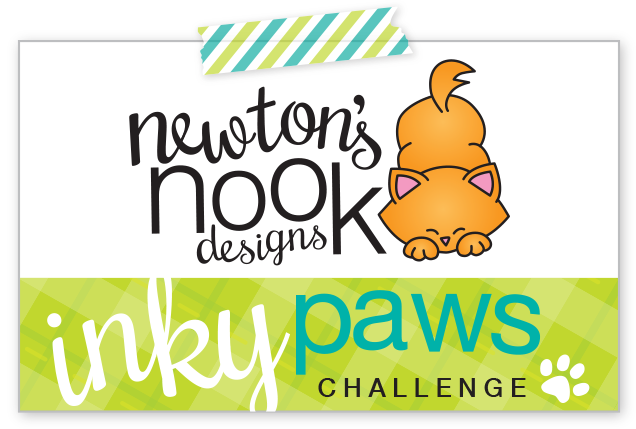 I just discovered your blog and am enjoying all your projects! Those label dies are way cool--love that they emboss as well. It gives that something extra added. As cool as those dies are though.... that stamp set! What a scream!!! Wow those label dies are great ! I can see me using them for so many projects and your card is fabulous ! 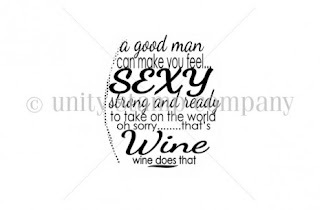 I love the sentiment on this card as well I like wine !!! I came back to see who won! is there no result yet? OSAT Blog Hop - Love Is In The Air! Gina Marie Designs Cross Stitched Square and MFT!